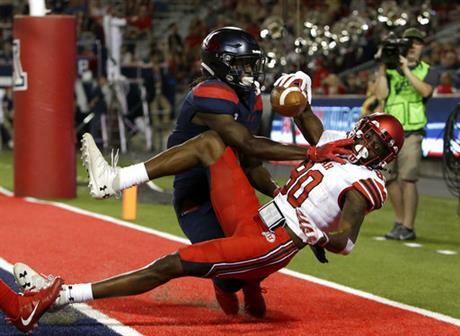 TUCSON, Ariz. – Despite a back-and-forth scoring montage throughout the game, the Utah football program never trailed Friday night against the Arizona Wildcats, sealing a 30-24 victory to improve to 4-0 overall and 1-0 in Pac-12 play. After starting quarterback Tyler Huntley (8-of-9, 98 yards, 1 TD) suffered an injury in the second quarter, senior Troy Williams came in and helped lead the Utes to victory. Williams finished the game 9-18 for 131 yards. 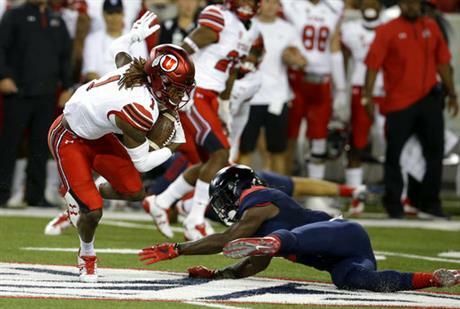 Darren Carrington II yet again led the Utes through the air with four catches for 76 yards while Zack Moss racked up 73 yards on the ground on 14 carries. On defense, Sunia Tauteoli led the team in tackles with seven (1.0 TFL) with Corrion Ballard and Casey Hughes chipping in six apiece. Both Ballard and Hughes also came up with key plays against the Wildcats with Hughes recording two forced fumbles and Ballard grabbing the late-game interception. Utah scored first with 10:35 on the clock in the first quarter on a second-and-6 when Huntley was forced to scramble to the side, finding Samson Nacua open in the end zone for an 8-yard touchdown to make it 7-0. Moss accounted for 41 of the 73 yards on the drive that took six plays and 2:26 off the clock. Arizona was able to score on its next drive, but the Utes held them to a 32-yard field goal, cutting it to 7-3 with 6:54 remaining in the first quarter. It ended a 12-play, 60-yard drive that burned 3:41 off the clock. The Utes added a field goal of their own after Bradlee Anae sealed a three-and-out with a sack and a 48-yard punt return from Boobie Hobbs set Utah up in Wildcat territory. Matt Gay knocked in a 41-yarder with 28 seconds left in the first quarter, making it 10-3 on just four plays, 5 yards and 2:01 used. After Huntley was sidelined with an injury, Williams took the reins, driving the Utes down field 91 yards for Gay’s second field goal of the game, a 26-yarder. The 14-play drive took 6:20 off the clock in the second quarter to give Utah a 13-3 lead with 5:39 left in the half. The long drives continued in the second quarter with Arizona finding the end zone with 1:39 on the clock, punching in a 1-yard rushing touchdown by quarterback Brandon Dawkins. It put an end to an 11-play, 75-yard drive that took 4:00 off the clock to cut the Utah lead to 13-10 for the last points of the half. Utah opened the third quarter with a key touchdown on a 1-yard rush from Williams to give Utah a 19-10 advantage with 9:46 on the clock. 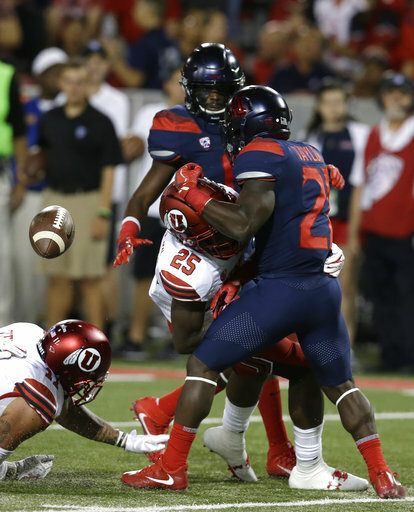 The 10-play, 75-yard drive hit a critical moment when Williams connected with Demari Simpkins on a third-and-18 for 37 yards to put Utah on the Arizona 2-yard-line. The Ute defense came up big after Chase Hansen grabbed an interception, but the offense went three-and-out on its next drive, giving Arizona the ball back on its own 35. The Wildcats were able to get back on the board with 4:38 left to play in the third quarter when JJ Taylor rushed into the end zone for 7 yards, narrowing Utah’s lead to 20-17 on a six-play, 68-yard drive. It was the Utah defense that put the next points on the board after freshman Javelin Guidry notched his first-career interception and pick-six, running it back 14 yards for the score. The Murrieta, Calif., native was able to step in front of his receiver for the pick, putting Utah up 27-17 with 2:03 remaining in the third quarter. Arizona had a chance to score early in the fourth quarter, but Lowell Lotulelei blocked a 47-yard field goal attempt, giving Utah the ball back on its own 29-yard-line. The Utes were able to run 4:32 off the clock on their next offensive drive, ending with a 37-yard field goal from Gay to give Utah a 30-17 lead with 4:58 left in the game. Arizona made it count with 2:44 on the clock when Dawkins linked up with Tony Ellison for a 30-yard passing touchdown, cutting the Utah lead to 30-24. It was a 75-yard drive for seven plays and 2:14 off the clock. It was a quick turn of events with Arizona recovering its onside kick, followed by Hughes forcing his second fumble of the game, with Chris Hart coming up with the ball, to put Utah on its own 25-yard-line with 2:33 left in the game. Utah turned the ball over on downs, giving the Wildcats a last chance effort with less than two minutes to play, but Ballard came up with an interception with 48 seconds on the clock, allowing Utah to run out the remaining seconds for the 30-24 win. Utah returns to action after its bye week on Saturday, Oct. 7, when the Utes host Stanford for Homecoming.